Phil Gim has been working for our community for many years. He is always hard-working and incorrupt. He has been living in the U.S. for more than 40 years which makes him the best person to represent our Chinese interest. 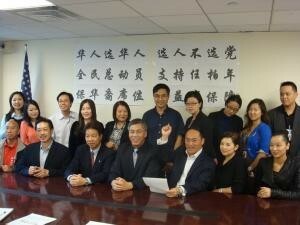 he suggested there is a lot of space to be improved for development in Flushing. evoked people to vote for Chinese delegates regardless their parties. The vice president of the Chinese American Startup Association (CASA) thought people should participate more during elections as Chinese delegates are very rare.